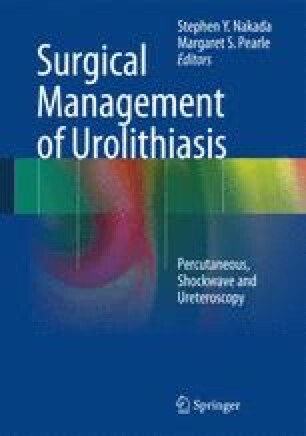 Since its initial description by Fernstrom and Johansson in 1976, percutaneous nephrolithotomy (PCNL) has evolved with improvements in technique and equipment to become the gold standard form of management for large stones in the upper urinary tract. It has now largely replaced open surgery in this context. Although alternatives such as supine patient positioning have emerged in the last decade, the vast majority of PCNL cases worldwide continue to be performed prone, with high stone-free rates (SFR) and a low incidence of major complications (Duvdevani et al., J Endourol, 21:824–9, 2007; de la Rosette et al., J Endourol, 25:11–7, 2011). The ability to safely and efficiently achieve percutaneous renal access depends on a number of factors including appropriate training, careful preoperative planning, recognition of anatomical variation, interpretation of radiological investigations, reproducible technique, and the availability of specialized instrumentation to effectively delineate and negotiate the urinary tract. Tract placement by the treating urologist without the involvement of an interventional radiologist in routine cases has been shown to be associated with excellent outcomes (Tomaszewski et al., J Endourol, 24:1733–7, 2010; El-Assmy et al., J Urol, 178:916–20, 2007; Watterson et al., J Urol, 176:142–5, 2006). Additionally, such an approach allows PCNL to be performed as a one-stage procedure with the opportunity to place additional tracts as dictated by intraoperative findings. This chapter summarizes what we believe to be a series of safe and effective strategies when performing percutaneous renal access. In presenting the chapter, we acknowledge that there are many effective alternate approaches to PCNL, some of which may not have been incorporated into this work. Many cases require the endourologist to safely apply a range of techniques in combination to achieve the desired outcome. Management of ureteral calculi: EAU/AUA nephrolithiasis panel. 2007 [cited 2012 Feb 10]. Available from: http://www.auanet.org/content/clinical-practice-guidelines/clinical-guidelines/main-reports/uretcal07/chapter1.pdf.